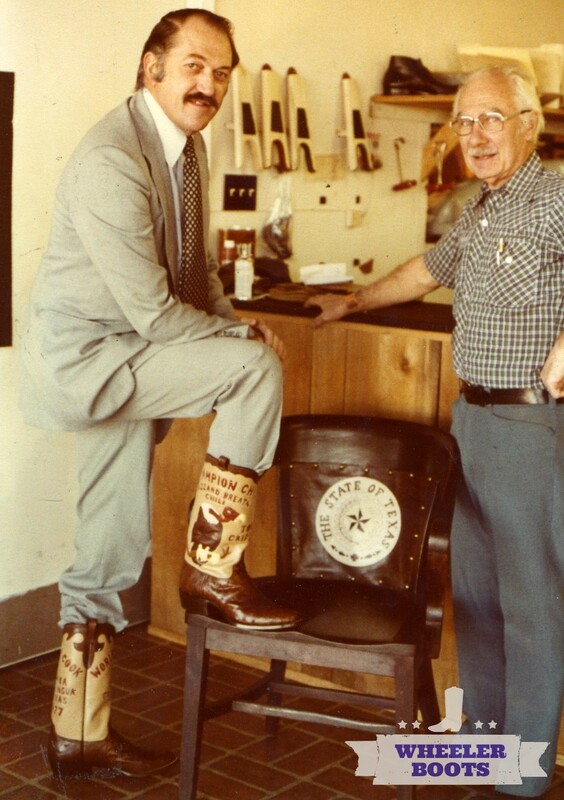 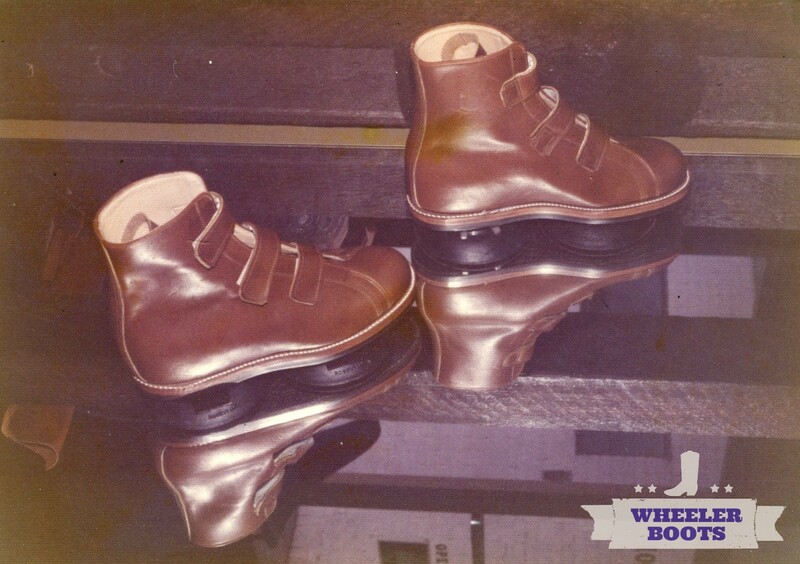 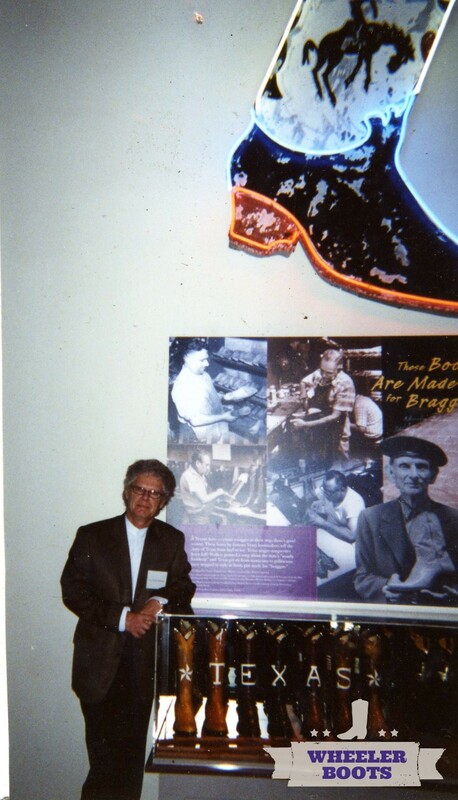 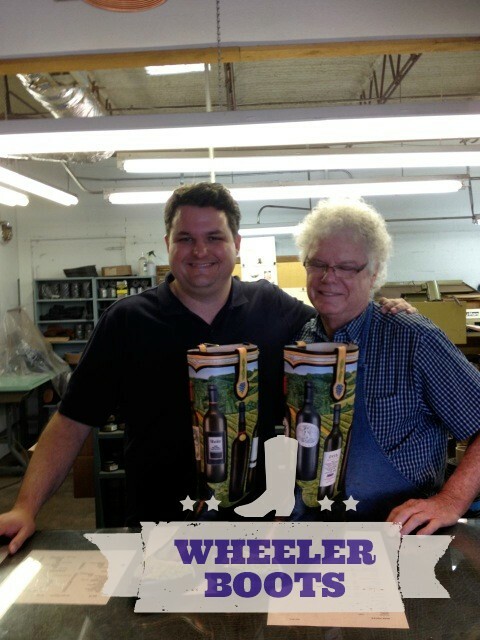 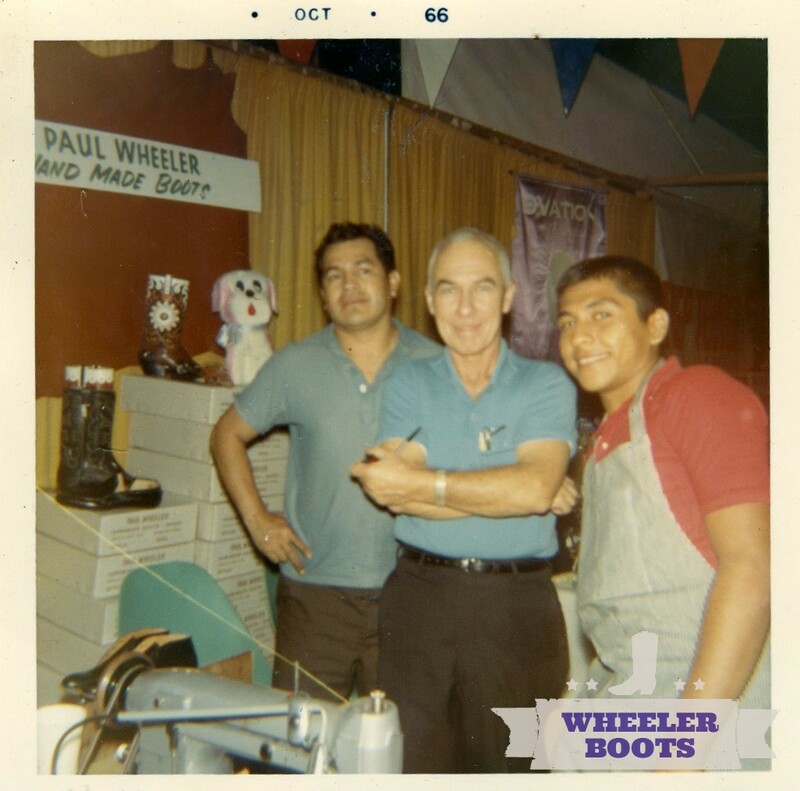 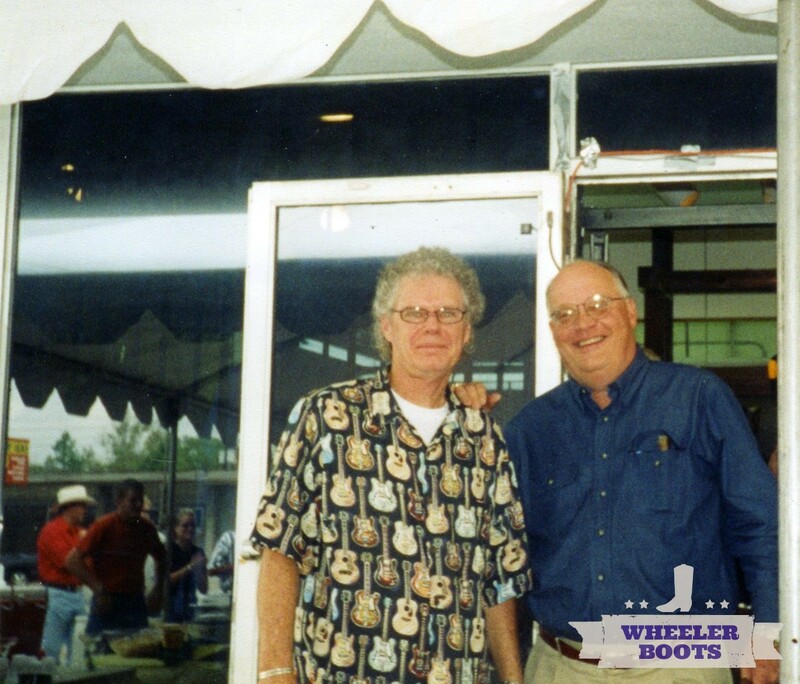 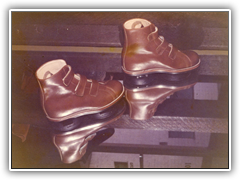 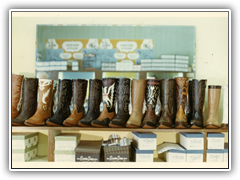 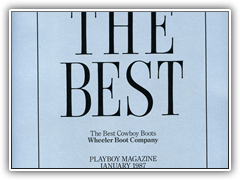 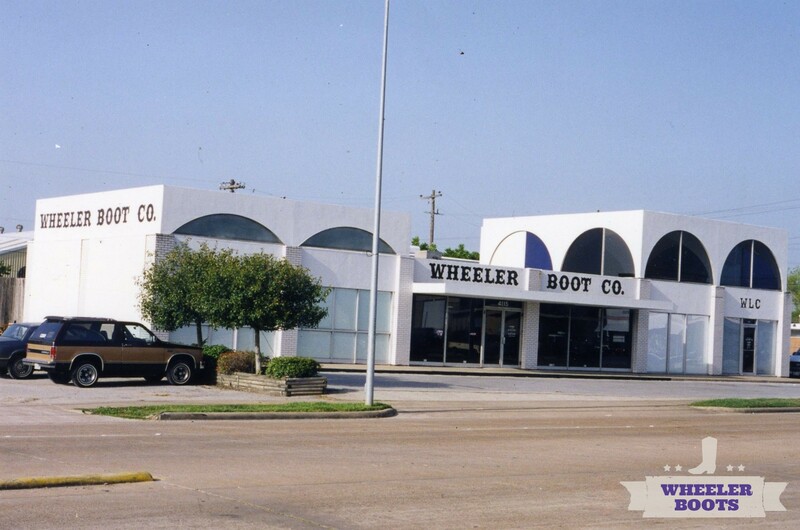 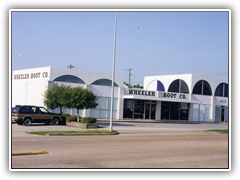 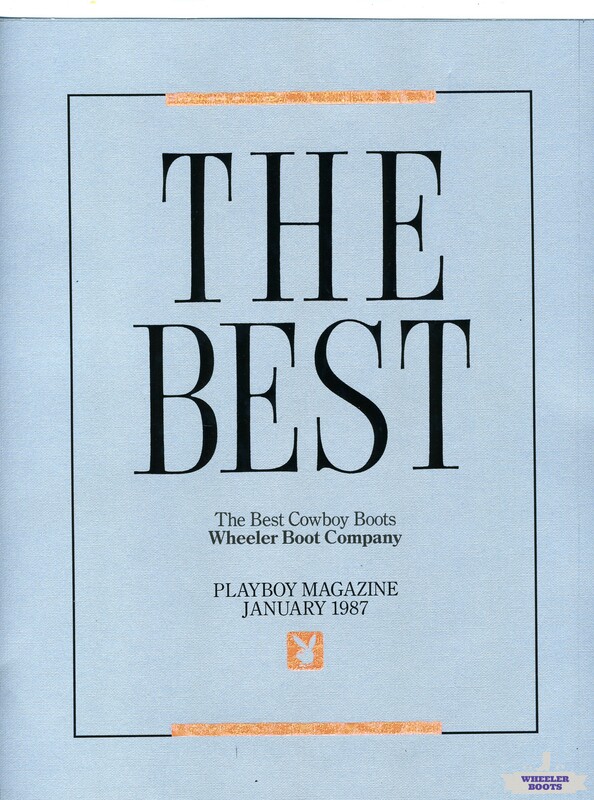 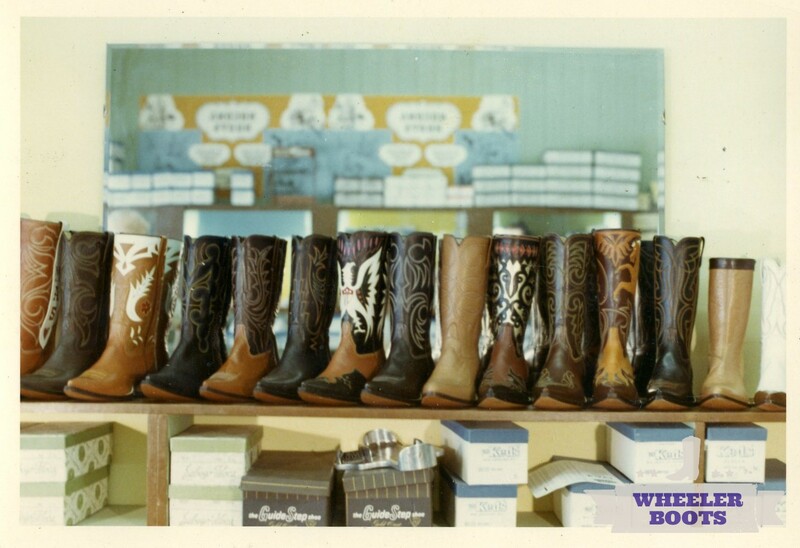 The Wheeler Boot Company was started in 1960 by Paul Wheeler. 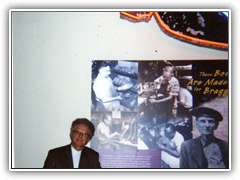 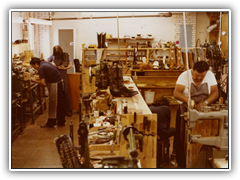 Reared in a Missouri shoemaking family, he moved to Texas in the forties and opened his own repair business. 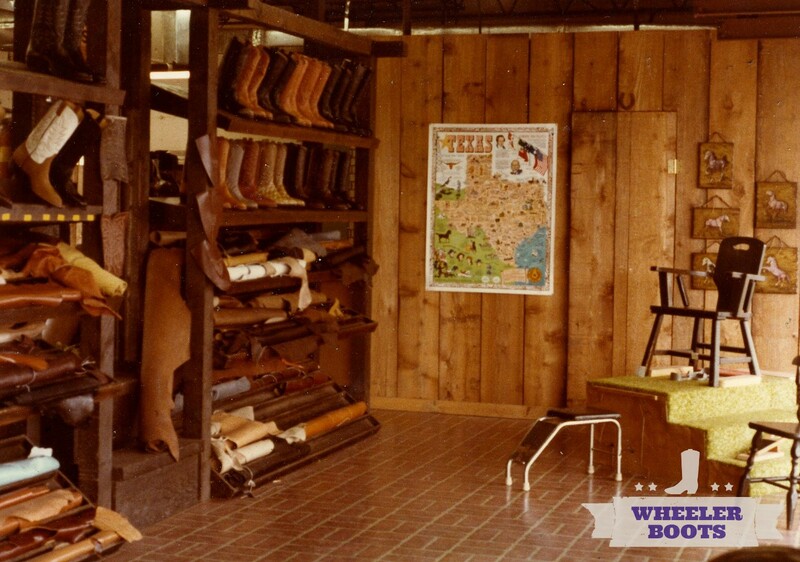 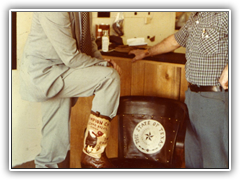 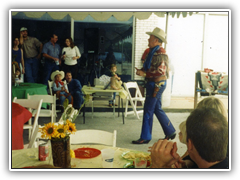 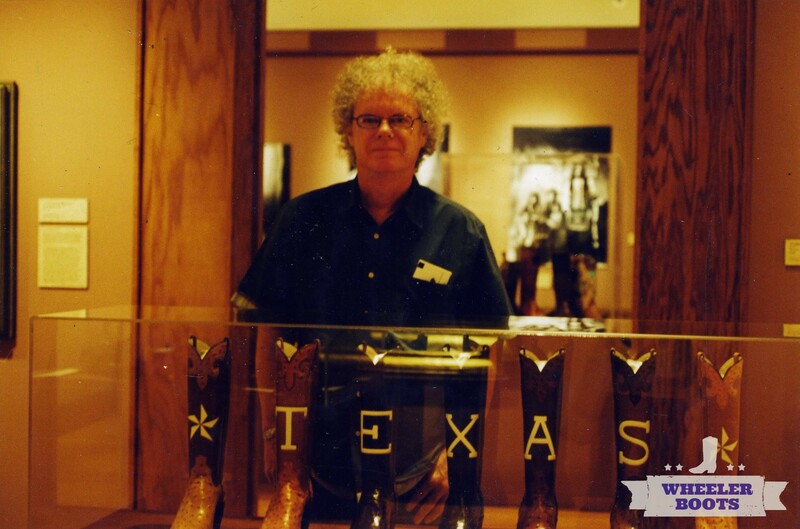 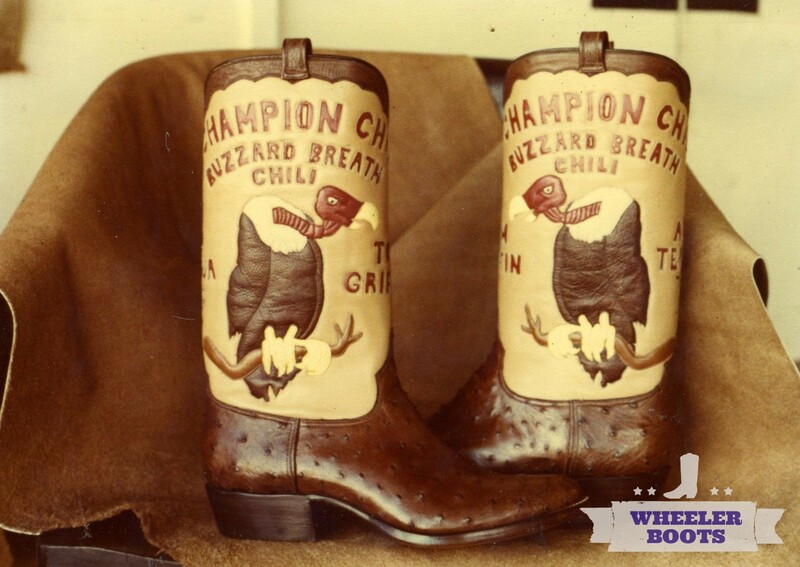 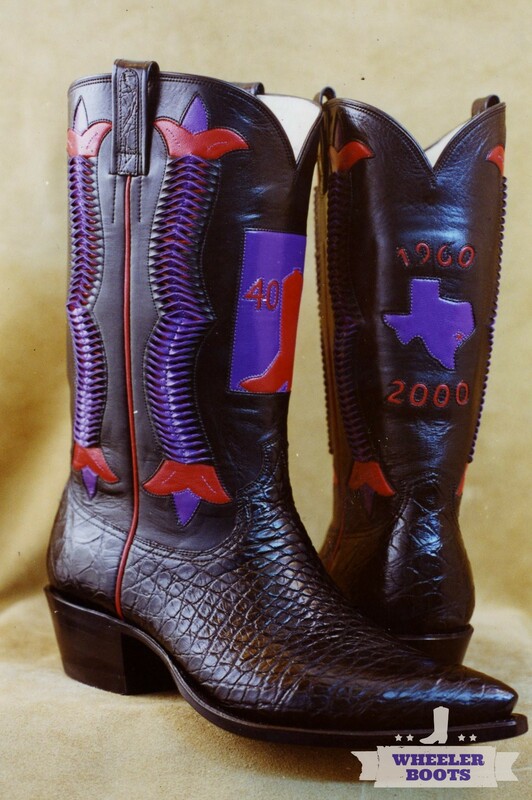 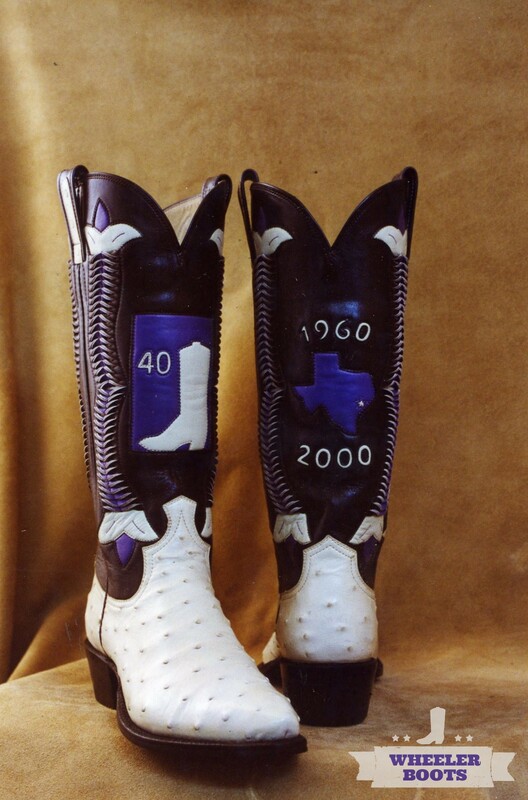 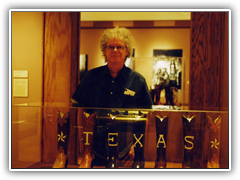 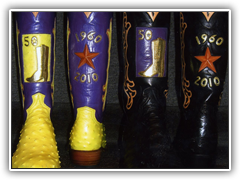 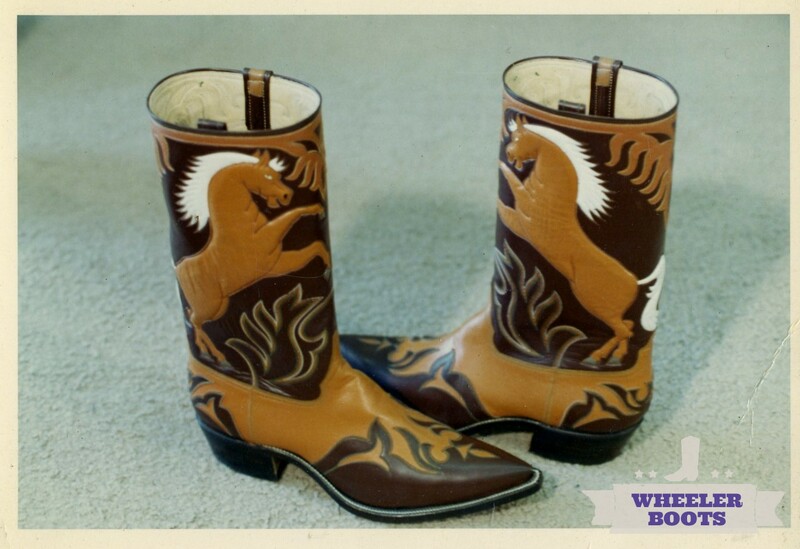 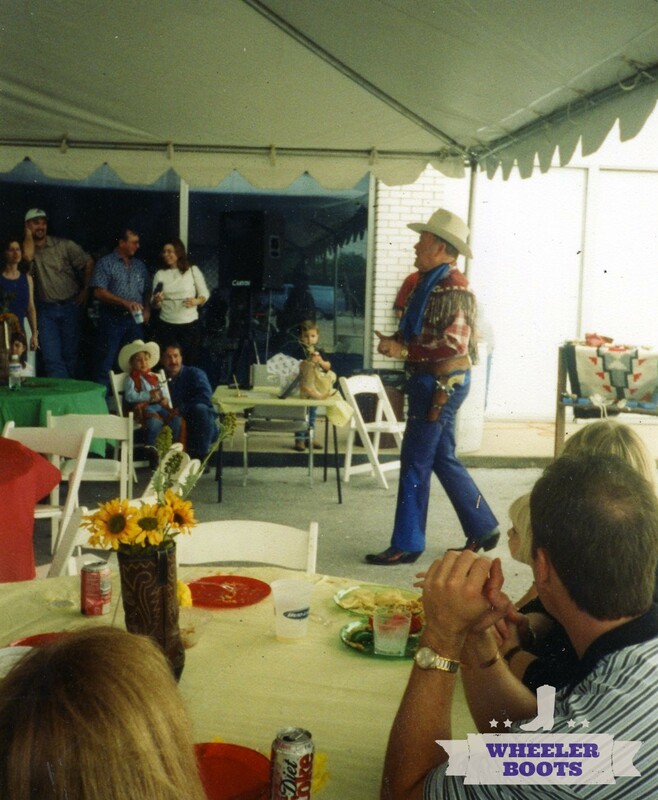 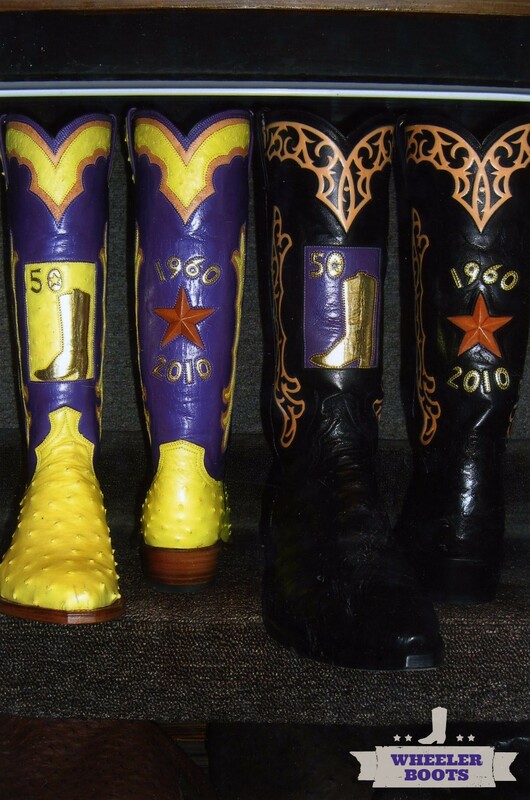 Eventually, he gave in to the Texas love of western boots and began doing custom ordered, handmade boots. 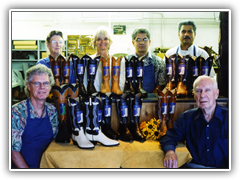 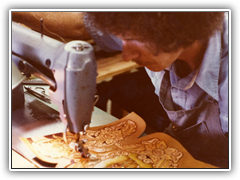 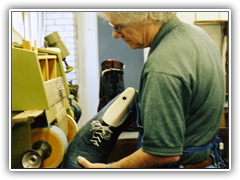 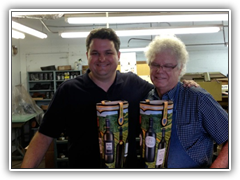 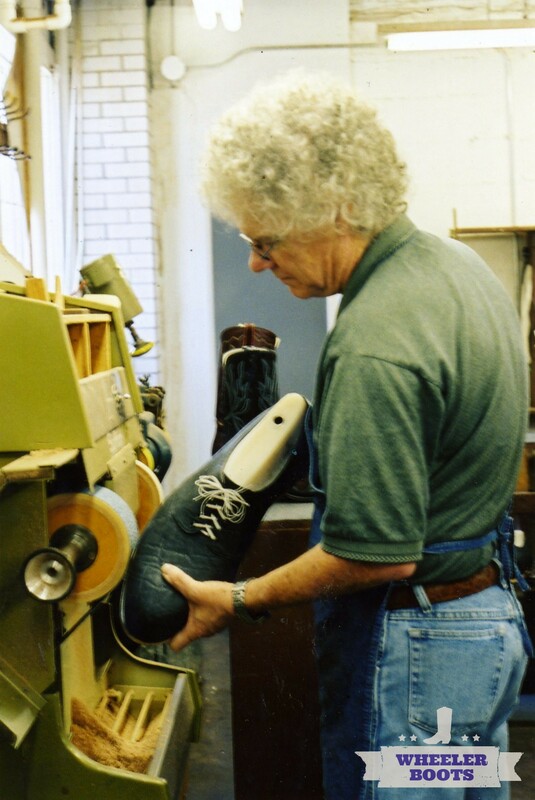 Since 1984, Paul’s son Dave has managed the shop, does the designing and crafts the boots along with longtime boot maker Jorge Amaro. 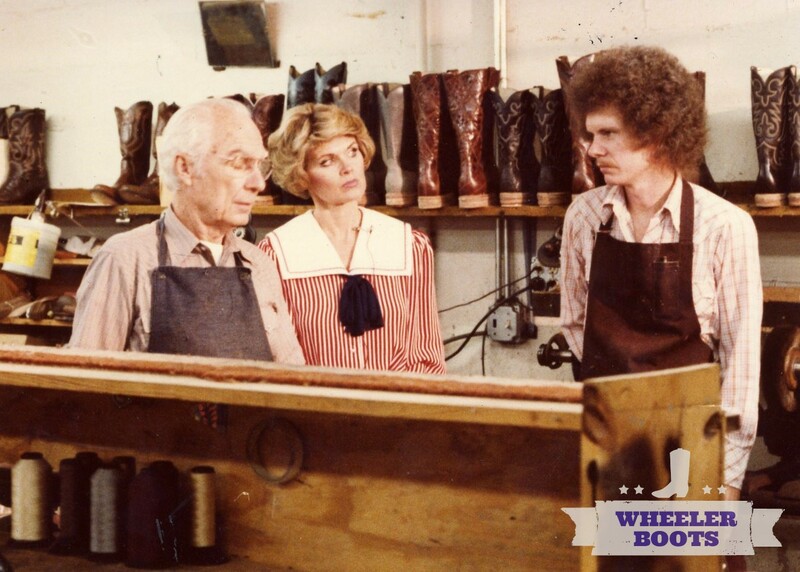 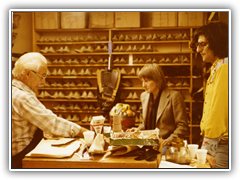 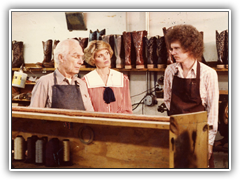 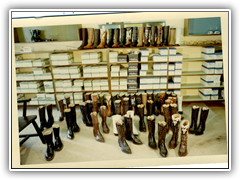 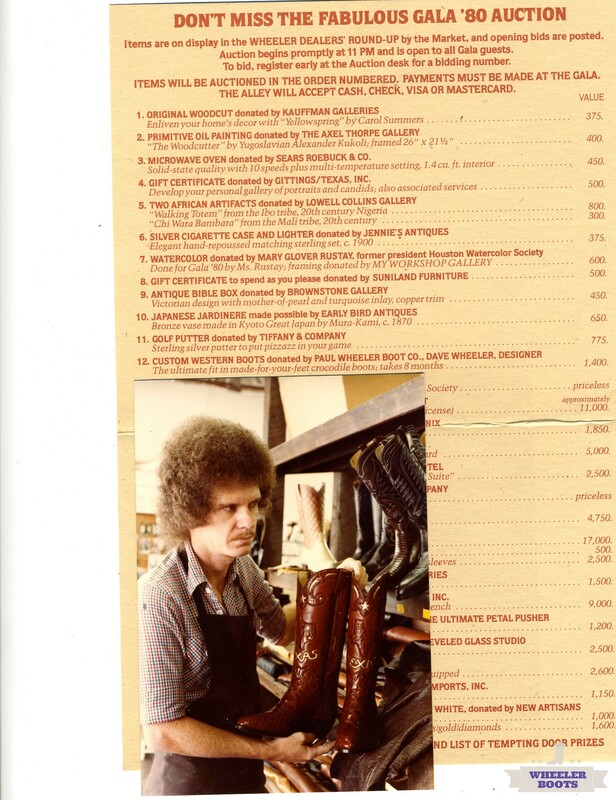 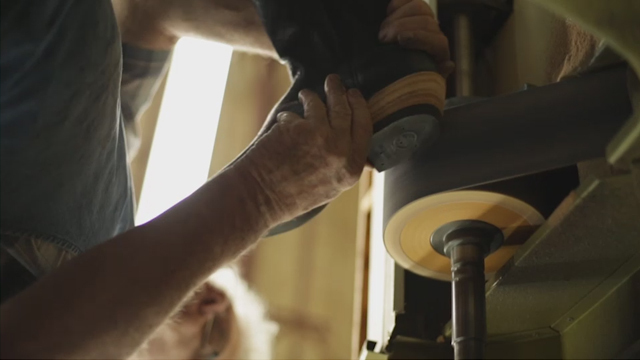 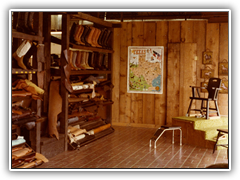 Dave and his wife Janis oversee each pair of boots from the initial selection of leather to the finished product. 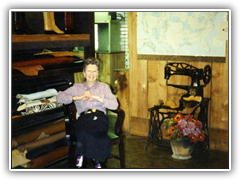 Each customer is measured personally. 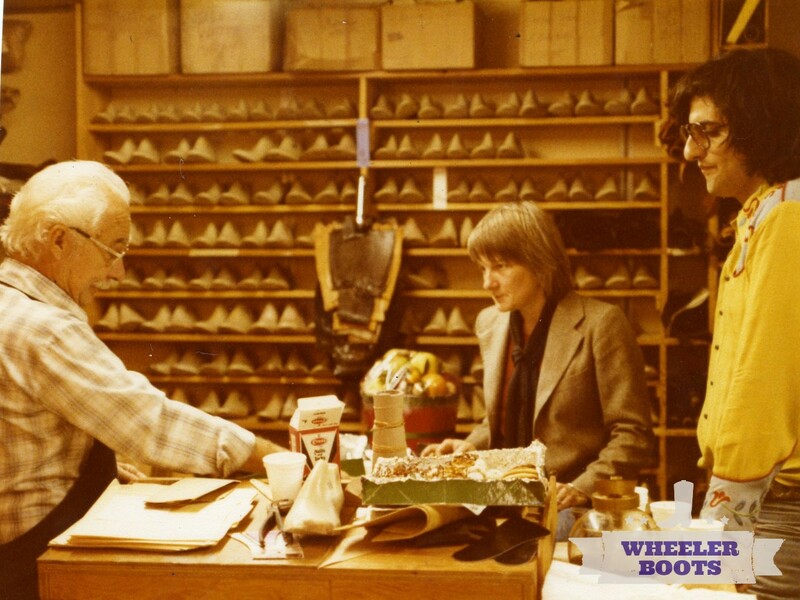 They choose the exact piece of leather their boots will be made with and all design, pattern and color considerations are discussed with the Wheelers. 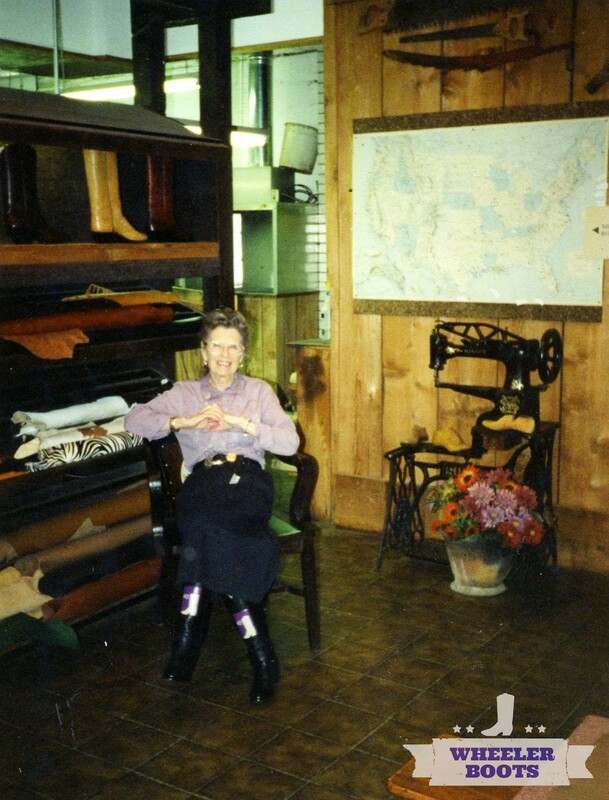 Clients even bring their own hides to have boots made. 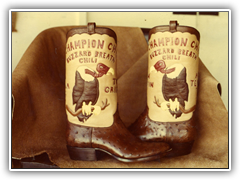 Many come from Louisiana and East Texas after alligator season when alligator boots become the “specialty of the house.” Many sportsmen bring in skins of snake, elephant and a variety of other exotics. 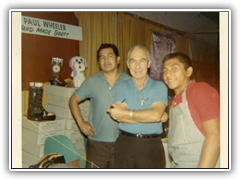 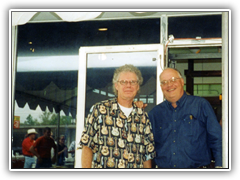 Through the years the clientele has grown, mostly by personal recommendations, from the people of the area and the United States to international customers. 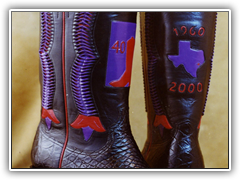 Boot styles run the spectrum from traditional dark calf, elegant alligator and ostrich, to vibrant multicolor designs that are limited only to one’s imagination. The flashy designs bring the craft of bootmaking into the realm of wearable art. 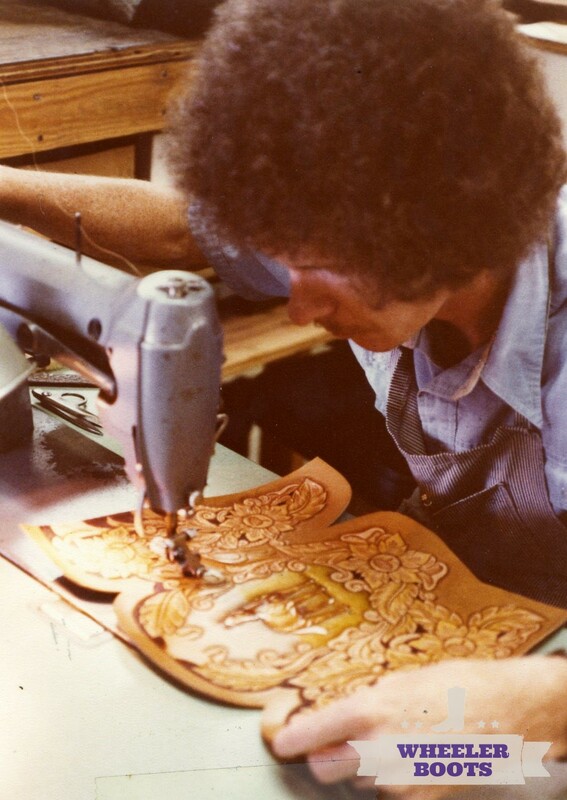 The Wheelers are able to take an idea, sketch or picture, and reproduce it in leather. 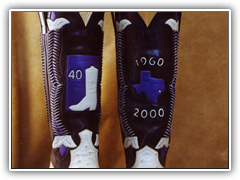 Subjects such as landscapes, architecture, motorcycles, a rock star riding a guitar, or a simple rose have evolved into boot art. 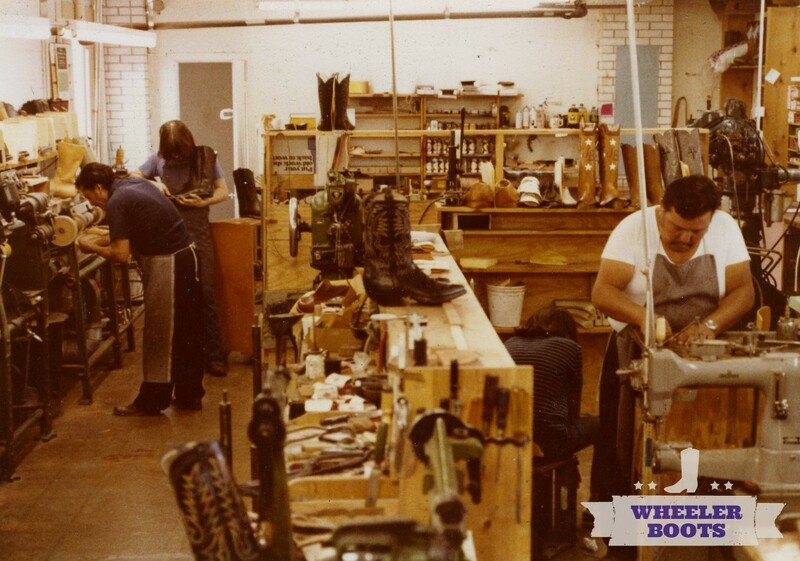 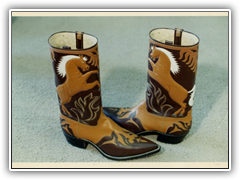 From traditional to contemporary, for the working cowboy or the surgeon, the goal of the Wheeler family was to construct a well-made boot that fit. 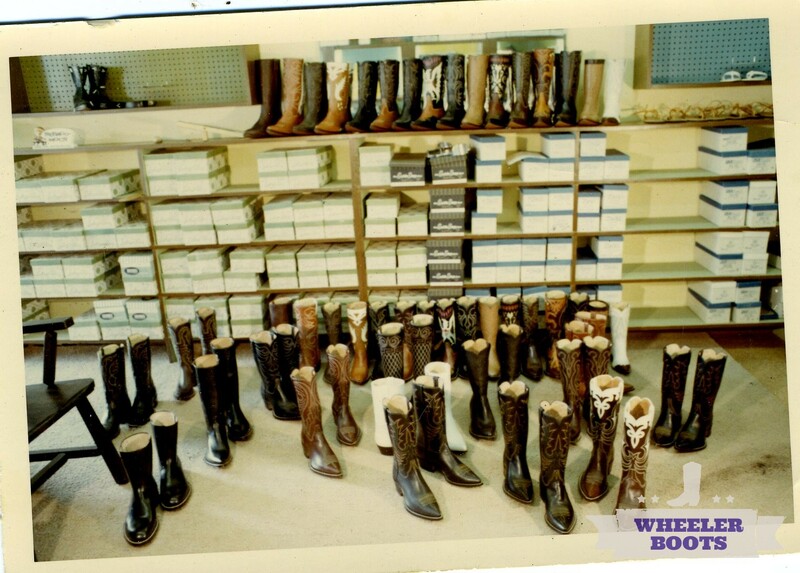 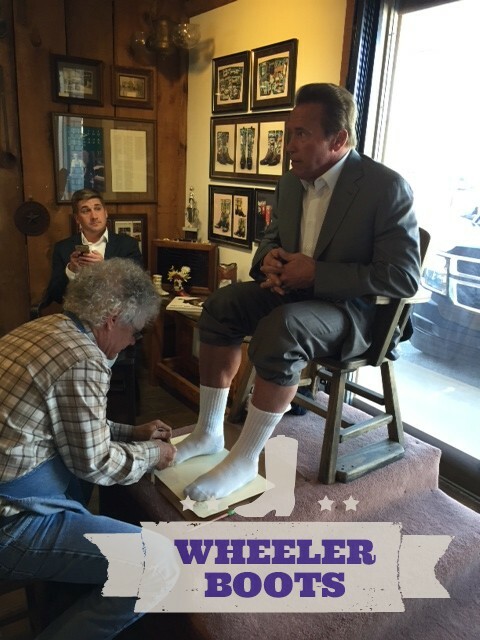 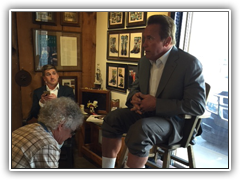 That’s why customers came to the Wheeler Boot Company for six decades. 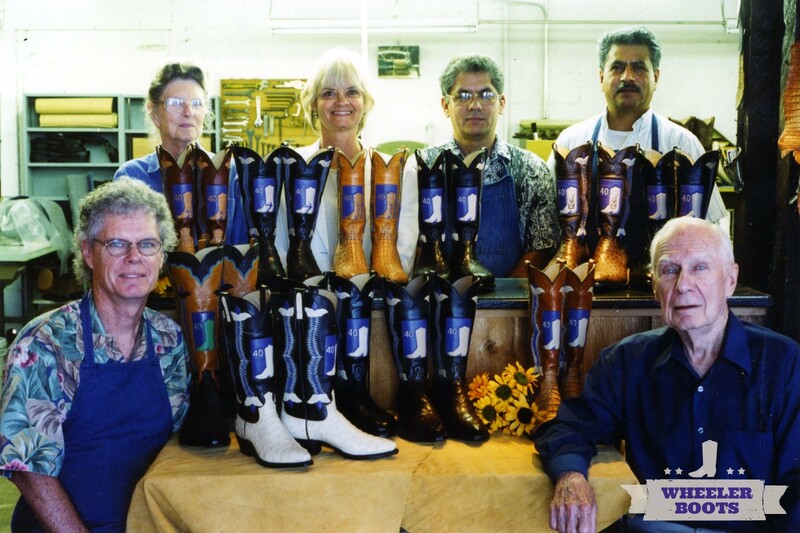 Those lucky customers now have boots that will last a lifetime. 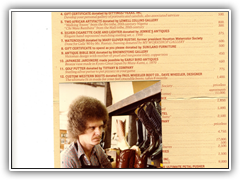 Click on the thumbnails below to see the image full size.